We have been treated like aliens. Perhaps they do not believe that we have received one and the same baptism or that we have one and the same God as Father. They think it a matter of contempt that we are Irish. Today we celebrate the feast day of Saint Patrick, our Patron Saint. From our April issue, Father Dermot Connolly of Africa Magazine reflects on the life of Saint Patrick, trafficked into Ireland a slave, and the slavery and human trafficking that persists in today’s world. Read his full article below. 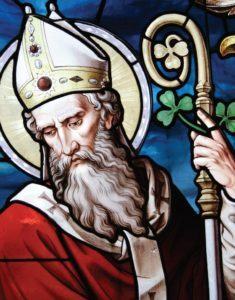 Saint Patrick was only fifteen years old when he was trafficked into slavery in Ireland; at least six years passed before he managed to escape back to his home in Britain. It left its mark on him: years later, after he had returned to Ireland, when some of his own recently baptised young people were kidnapped, and some were murdered, he was deeply angered: he wrote to the slave-traders, ‘You hand over members of Christ into what could be called a brothel.’ In our own times, it is still the fate of many who have been taken and enslaved. Patrick was accusing a slave-raider named Coroticus, who operated from somewhere on the west coast of Britain. The young Patrick’s own captors had come from Ireland, from the ‘heathen peoples’ – now as an adult and a bishop it seems he has come up against slavers who are nominally Christian. What is he to do? He cannot take up arms against them, but he can carry the battle to their home base and try to isolate them – especially if the Church leaders and Christian communities in Britain support him in this. Manuscript copies of Patrick’s Letter to the Soldiers of Coroticus (and of Patrick’s other extant writing, his Confession) remain to our own times, and are studied by scholars such as Bishop Joseph Duffy, whose translation and learning I am gratefully using. What also remains is slavery itself, and who are most likely to be taken: children, women, the frightened, the foolish, the desperate, the despised. I wonder if this is what Patrick has in mind when he writes, ‘We have been treated like aliens … They think it a matter of contempt that we are Irish.’ He has identified with the Irish he had come to serve. The splendid, heroic people who work against slavery in our own days would recognise what he was doing. First published in Africa magazine.